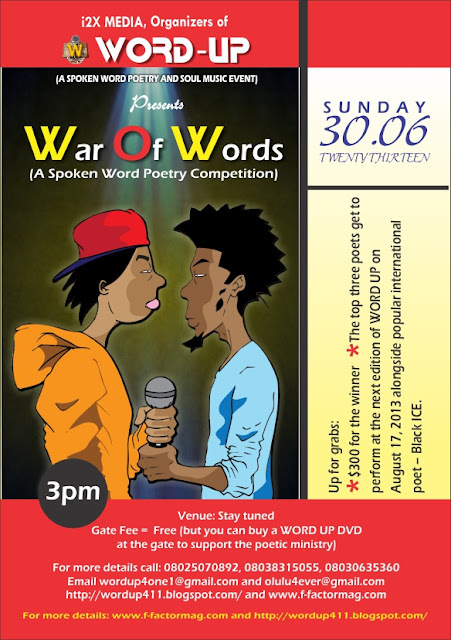 WORD UP: Video submission for War of Words (Slam Poetry Competition) extended by 3 days. Video submission for War of Words (Slam Poetry Competition) extended by 3 days. 1. The young lady calling and crying on phone that she was unable to upload her video due to poor internet network. 2. The guy threatening to kidnap our laptops if we close shop before he puts in his entry. 3. The 2nd chance given to a disqualified entry. 4. The original poetry piece been expected from oga at the top. We are extending the deadline for the video submission for War of Words (Slam Poetry Competition) by 3 days. Deadline date is now midnight June 17, 2013. The competition proper comes up on Sunday, June 30, 2013 from 3pm. The Venue will be communicated after the expiration of the video entry deadline. The 15 poets to compete live on stage at War Of Words will be announced on or before June 22, 2013.